Hang on to summer by embracing the season’s final-scene offerings, from farm-to-table meals and wine tours, to river paddling and big lake fishing. A September Northern Michigan vacation offers indoor and outdoor options for all ages. Taste fall at Boyne Mountain, where three-course dinners on September 9, 16, 23 and 30 feature produce and meats from local farms and regional suppliers. Each course is paired with Michigan beer and wines. ($29 per person, includes day spa pass) The series ends October 7 with a five-course meal and live music fundraiser aimed at providing nutritious foods to low-income families. ($39/person). BOYNEMOUNTAIN.COM; reservations by calling 231.549.7959. Engage your mind (and feed your inner bibliophile) at the first-ever Harbor Springs Festival of the Book September 3 through October 2. This three-day gathering serves up 40+ nationally known presenters and celebrates “books and the stories that make them great.” Writers Jerry Dennis and Mardi Jo Link are among those who will talk about their craft during keynotes, luncheons, readings and other festival events. Find lodging specials at Boyne Highlands. HSFOTB.ORG; BOYNE.COM/BOYNEHIGHLANDS. Toss a line in Lake Michigan—and catch the evening’s dinner—in the coastal town of Frankfort. Tiny Bubbles Charters, a third-generation charter fishing operation and Red Hot Best winner, will make the trip memorable, whether you’re looking for a big king salmon or smaller panfish. If inland lakes are more your style, Tiny Bubbles offers trolling, casting or jigging for a variety of fish on lakes like Crystal, Platte and Herring. The charter business is located in East Shore Marina, Frankfort. TINYBUBBLESCHARTERS.COM; 231.383.1500 or 231.352.7076. Sail into the sunset in Benzie County. Enjoy views of the coastline from Sleeping Bear to Arcadia Bluffs on a 44-foot wooden sailboat operated by Frankfort Sailing Excursions. Sunset sails start at 6:30 p.m. in September, with a two-person minimum. BENZIE.ORG; 231.360.0307. Get your Stompede on. Run, walk or watch this fall race tradition on September 10 and 11, then enjoy wine and local food at 22 wineries on the Leelanau Peninsula Wine Trail. 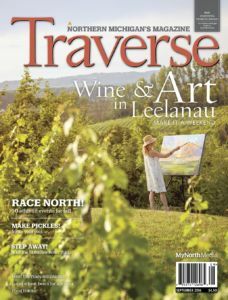 The Harvest Stompede running race through Leelanau’s vineyards (7-mile and 5K run/walk options) is followed by a self-guided wine tour featuring wine and culinary delights. ($40/person, not including race registration.) A variety of discounted race weekend lodging packages, on the Leelanau Peninsula and in Traverse City, are available. LPWINES.COM/HARVEST. Go back in time in Manistee County, home to 80+ historic sites. Four self-guided routes will take you through the historic central business district of downtown Manistee, east and west historic homes of Manistee and destination sites throughout the county. (One not-to-miss spot: the Kaleva bottle house, built using some 60,000 glass bottles.) Each tour starts and ends at a museum, where local history buffs offer up even more backstory. VISITMANISTEECOUNTY.COM/MANISTEE-HISTORIC-TOUR. “Grocery shop” on US31, a scenic stretch of highway between Traverse City and Charlevoix that’s studded with family farm stands brimming with produce this time of year. Community farmers markets also entice. Grab your apples, squash, cucumbers and tomatoes at the Sara Hardy Downtown Farmers Market in Traverse City on Wednesday and Saturday mornings through October. Farther north, make a stop in the village of Elk Rapids, where Fridays on the river mean a bounty of seasonal fruits and vegetables, baked goods, dairy products and plants from 13 area counties through October 7. Charlevoix’s market is at East Park, along Bridge Street, through October 6, switching to afternoons at the library through November 17. DOWNTOWNTC.COM, ELKRAPIDSCHAMBER.ORG, CHARLEVOIX.ORG.. This “Soak Up September” story was originally published in the September 2016 issue of Traverse, Northern Michigan’s Magazine.